We are thrilled to offer our Mobile Spay/Neuter Services to our community! Check out our FAQ below to learn more about this exciting new program. Q. 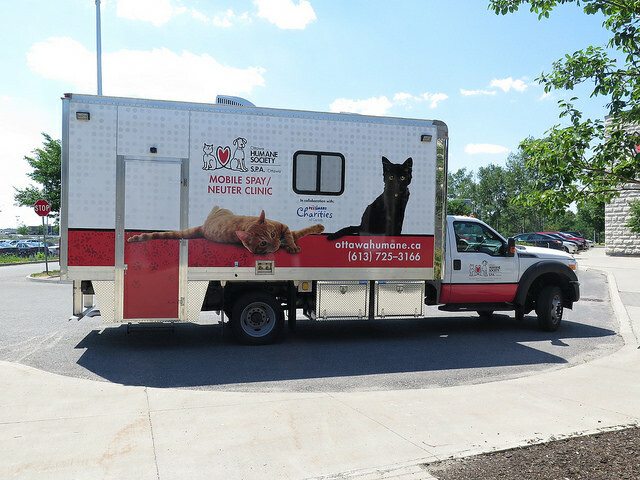 What is the OHS Mobile Spay/Neuter Clinic? A. The OHS Mobile Spay/Neuter Clinic is a mobile veterinary spay/neuter clinic that provides subsidized feline spay/neuter surgeries for low-income pet owners in targeted Ottawa neighbourhoods. Q. Why has the OHS decided to launch the Mobile Spay/Neuter Clinic? A. Our main goal is to address the problem of cat overpopulation in Ottawa. A second goal is to help preserve the human-animal bond by providing a service to help pets stay with their owners, rather than be surrendered to the OHS. Q. Where will the OHS Mobile Spay/Neuter Clinic be operating? We will expand our reach once we have had an impact in these areas. View locations and the Mobile Spay/Neuter Clinic schedule here. Q. Do I have to live in one of the ten neighbourhoods to be eligible for this program? A. No, you can meet our mobile clinic at any location that is convenient for you, as long as you are a resident of the City of Ottawa. Q. Who qualifies for services from the OHS Mobile Spay/Neuter Clinic? Q. What animals qualify for services from the OHS Mobile Spay/Neuter Clinic? A. Our clinic provides services for healthy cats between four months and eight years of age. A maximum of two cats per client will be accepted each clinic day. We currently do not provide services for dogs. Q. What are the costs for services? A. We provide subsidized spay/neuter surgeries for $20 per cat. We also provide optional microchipping for $20 per cat, as well as complimentary nail trimming and ear cleaning. A. Clients arrive with their animals at 8 a.m. at the scheduled clinic location for registration and arrive to pick up their animals at 3 p.m. that same day! Q. How is the OHS Mobile Spay/Neuter Clinic funded? A. Vehicle and start-up costs have been largely funded by PetSmart Charities of Canada. 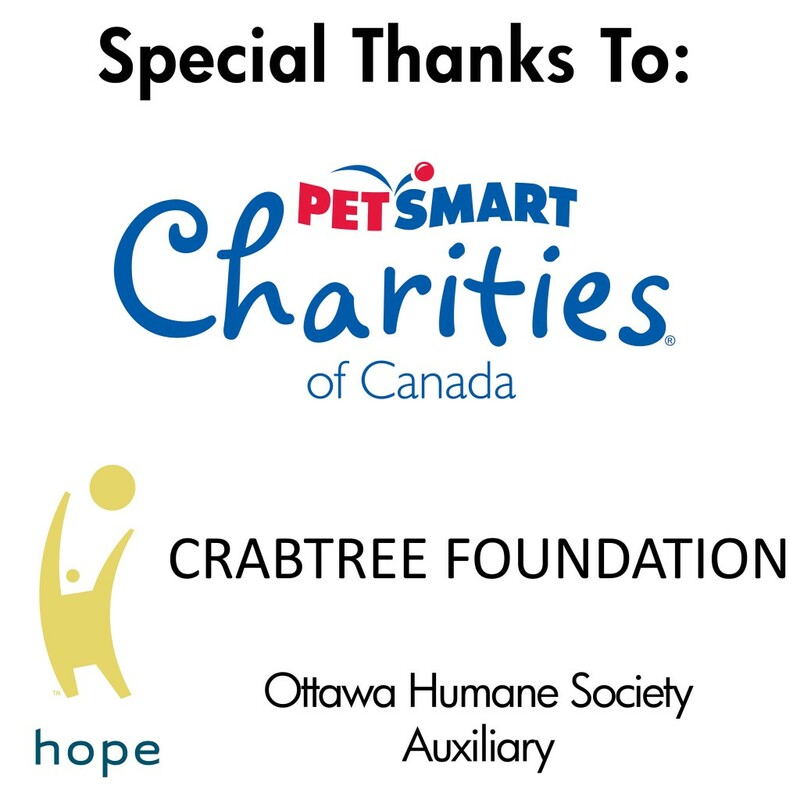 Our other significant contributors include The Crabtree Foundation, HOPE Volleyball Summerfest and the Ottawa Humane Society Auxiliary. However, ongoing operational costs rely on donations from our community. For more information, please contact our mobile spay/neuter services department at 613-725-3166 ext. 222 or mobileservices@ottawahumane.ca.